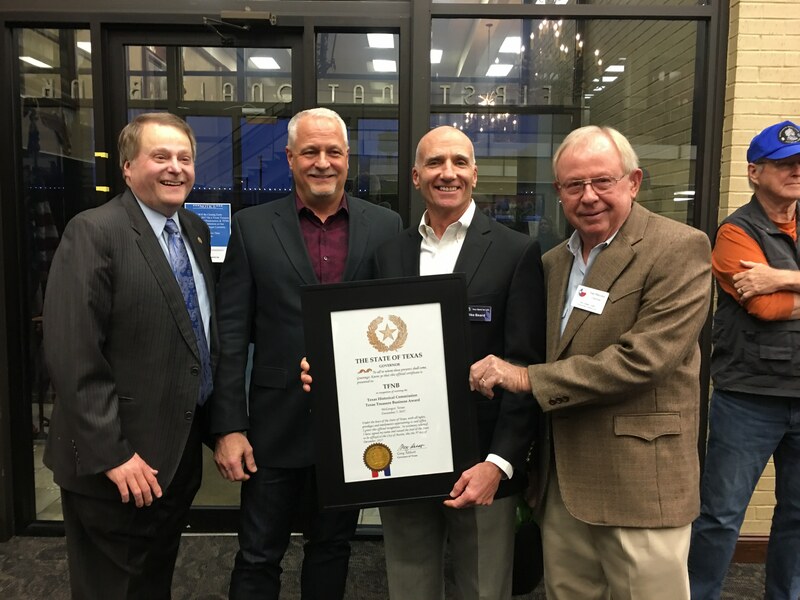 McGregor, TX — TFNB’s longevity in the community and contributions to the state economy and local community have earned it the Texas Treasure Business Award, TFNB bank officials announced today. The Texas Treasure Business Award honors businesses that have been operating for more than 50 years and that create jobs and stimulate economic growth. Representatives from the McLennan County Historical Commission presented the award to TFNB on December 7th. The First National Bank of McGregor, now operating as TFNB, was founded as an independently owned, community bank in 1889 in McGregor, Texas by a group of local businessmen. Since then, the bank has been an active employer in Central Texas with more than 60 employees today. The bank’s Articles of Association, which was signed on June 28, 1889, show Chas. F. Smith as cashier, who was paid $100 a month and a bookkeeper who was paid $50 a month. In 1957, the bank moved from its original location at 217 S. Main in McGregor, Texas to a more modern building across the street and two blocks south to 401 S. Main, where its downtown McGregor bank is located today. It was purchased in the 1960’s by a group of area businessmen. Two stakeholders were Pat Beard and David Kultgen, lifelong business and law partners. Today, TFNB is owned by a new generation of bankers known as McGregor Bancshares, Inc. Beard’s son Mike oversees the bank from the downtown McGregor location, and he serves as chairman of the board. Kultgen’s son serves as a director on the bank’s board. In 2000 Mike Beard hired Waco native David Littlewood as president to run the bank. Littlewood, now president and CEO, brings years of banking experience as well as connections from the bank’s early days. James E. Brown, the brother of Littlewood’s maternal great-great-grandmother, was raised in Crawford. After college he returned to Central Texas, where he, his wife Edna and children resided in McGregor for nearly 30 years. It was during this time he served as president of the bank. He was active in politics and was among the founding contributors to Southern Methodist University. In 2006, the bank opened TFNB South Bosque on Highway 84 on the eastern edge of McGregor to serve the growing population between McGregor and Waco. TFNB’s third full-service location, TFNB Triangle Tower, opened to serve Waco customers in early November. Next summer, TFNB will open its fourth full-service location at 901 S. 8th Street in downtown Waco. TFNB offers a full array of trust services and financial products, ranging from traditional, interest-bearing checking, savings, money market and CD accounts to modern conveniences such as debit cards, credit cards, ATMs and Internet banking. The bank’s lending team offers commercial, agriculture, real estate, mortgage and auto loans, as well as personal loans. It is the oldest bank in McLennan County and the seventh oldest national bank in Texas still operating under its original charter. Visit tfnbtx.com for more information.